Georgia's President Mikhail Saakashvili has disbanded the parliament of Ajaria and imposed a direct presidential rule in the autonomous province. The move follows Thursday's resignation of Ajaria's rebel leader, Aslan Abashidze, after huge street rallies. Mr Saakashvili also abolished the post of Ajarian leader and set up a provisional council to administer the province until elections due in June. The president said earlier he would not seek Mr Abashidze, who fled to Russia. The BBC's Chloe Arnold in Georgia says the elections in Ajaria are likely to establish a cabinet of ministers who will run the Black Sea territory, and will be answerable to the central government in Tbilisi. The collapse of Mr Abashidze's heavy-handed rule came after a month-long confrontation in which his armed supporters blew up bridges linking Ajaria with the rest of Georgia. After Mr Abashidze's resignation, hundreds of people on the streets of the regional capital, Batumi, congratulated each other. 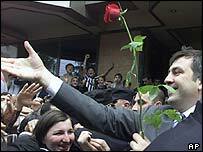 Georgians are calling the events of the last few days their second "rose revolution". The first took place last November when Mr Saakashvili led a peaceful uprising to overthrow his predecessor, Eduard Shevardnadze. He took office in January after a landslide election win. Mr Abashidze was a Soviet-era politician who strongly opposed the Western-leaning Mr Saakashvili. The crisis aroused the concern of Russia, Europe and the US, all of whom consider the Black Sea state to be of key strategic importance. The US is backing the construction of a multi-billion dollar pipeline to transport Caspian Sea oil through the volatile region to the international market. Russia, a giant among the world's oil exporters, retains a military base in Ajaria, where there is a substantial ethnic Russian community. Washington welcomed "the peaceful restoration of Tbilisi's authority" and called it a "historic day" for Georgia.